Born on February 9, 1973 in Koumi-cho, Nagano Prefecture, Japan, his real name is Makoto Niitsu. 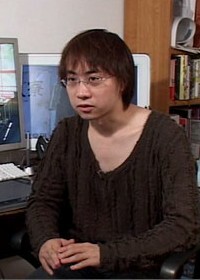 He is a Japanese animator and director. After attending the faculty of Japanese literature at the university, he dedicated himself to his youthful passion: anime, manga and novels that he loved from middle school. So he puts his effort to completely create his own works. Regarding the world of animation, Shinkai is a great fan of the work of Hayao Miyazaki (and in particular of the film Laputa), and some industry magazines identify him as his artistic heir. Shinkai's first work was Kanojo To Kanojo No Neko (you and the cat), an animated short film made in 1999; the OVA shows the day of a cat and its young mistress seen from the animal's eyes. This debut work has won several international awards in its category, such as the grand prize of the DoGA CG Animation in 2000. In 2016, the international consecration arrives, if it were still needed, with the film Your Name, an award-winning blockbuster with great incoming at the box-office at home and around the world.